The Benefits of Tree Trimming | Your Way Tree Trimming Inc. The benefits of tree trimming are many. When you get your trees trimmed, it can help quite a bit. Most people are amazed at the difference when they finally get their trees trimmed. The most important word of this is “trimmed.” We’re not saying that it’s always necessary to get your trees completely cut down or something. Rather, a trimming, when done by professionals, can make your property look gorgeous as well as provide numerous other benefits. In this blog, we’ll go over what some of those benefits are, as well as how we can provide them. The first and most basic reason to get your tree trimmed is that it’s in the way. For many people, even the most beloved tree can obstruct their view. Perhaps it’s the view from a window to the outside, or perhaps it obstructs their view of the valley below (or the city in the distance). We have several clients who have periodically trim their trees because it interferes with their satellite television. Some of these electronics can be very sensitive, and at times a tree has to be trimmed out of the way so that they can operate their very best. In California, many people use solar power. Trimming your trees can give your solar panels an unobstructed view of the sun, bringing in more power. Many people have this idea in their heads that, when a tree is trimmed, it makes the tree weaker or brings it closer to death. Often, the exact opposite is the case. Trimming your tree the right way can make it healthier and feel better. Many of the branches on your tree that are dead or dying aren’t serving the tree well. In fact, they’re making it more ill. Our professionals can show up and trim those branches off to improve your tree’s health significantly. See, those branches are actually dangerous. If you have kids (or if you try to climb them yourself) they could snap off easily. So as to keep that from happening, we can trim those trees right up. In our area, not everyone has to worry about trees growing and falling into power lines. Often, utility workers take care of that. However, some locations do require homeowners to take care of these trees on their own. We can come in and, at a reasonable rate, get rid of these trees for you. By that same token, making sure to have your trees trimmed often can make them less heavy. That means that they’re less likely to fall over during a heavy downpour or storm. By making sure that your trees are trimmed on a consistent basis, you’re ensuring that the entire neighborhood is that much safer. Some people have the idea that tree trimming is something they can do on their own. This isn’t the case. This is specialized, delicate work. It requires the touch of a professional. We’ve been doing this for more than 20 years, so we know how trees grow in the area. More importantly, we know how to bring them down safely. An often overlooked factor: a tree trimming service likes ours has the right amount of liability and workers’ compensation insurance. That means that you’re insured no matte w what happens. If you try to cut down the tree yourself, you don’t have that insurance. So, say that you try cutting down a tree that’s blocking your view. You’ve never done this before, so the tree falls and crashes into your home. Perhaps it breaks your window and your television. Maybe you’re even (God forbid) hurt in the process. You would be liable for all of that and would have to pay the entire cost. However, if you let tree trimming experts like us handle it, you wouldn’t have to worry about any of that. We do everything we can to make sure the entire tree trimming process is as safe as possible. Then, should anything untoward happen, our insurance will make sure you aren’t accountable. It’s one more way that our tree trimming service can protect you. We can put all of our tree trimming experience to work for you. 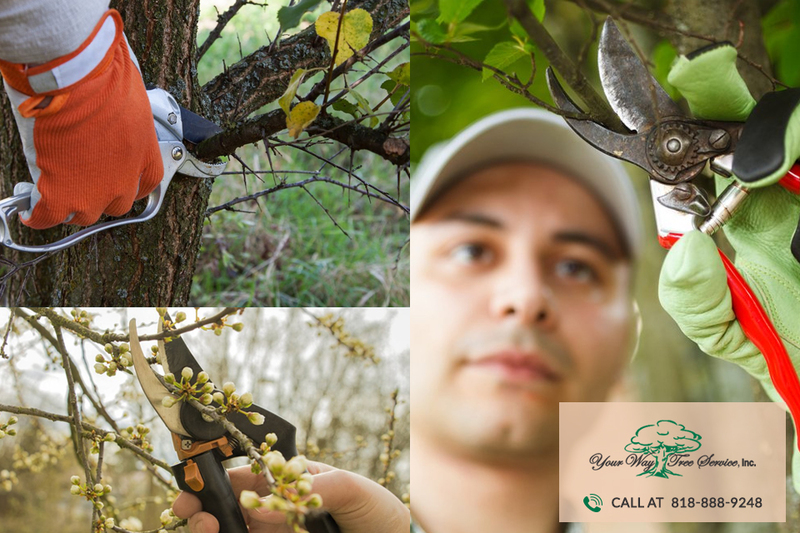 By using only the best, most cutting edge and state of the art equipment, we make sure that your tree trimming is done completely and thoroughly. By that same token, we can sit down with you ahead of time to figure out exactly what you need to be trimmed and why. Our rates are competitive so that anyone who wants to get a tree trimmed can afford to have it done by the professionals. To set it up, give us a call at (818) 888-9248 or head to our site.